Japanese Episode AG 075: "Taiketsu! Kyoudai Namazun to Tsuri Meijin!!" American Episode 347: "Whiscash and Ash"
Satoshi is eating lunch one day when the young trainer falls and drops his Badge Case! The case lands in the mouth of a giant Namazun, and it seems as if the catfish pokemon has no intention of returning it. Satoshi jumps into the lake to go after the pokemon, but the chase is cut short when his foot gets caught in some of the seaweed at the lake's bottom! Luckily, Satoshi is saved by an old fishing master named Suzumura. The old man reveals that he's been going after this giant pokemon for 50 years now, and he offers to teach the young trainers how to fish in order to catch it. The training begins, but nobody seems to be getting any better. Fortunately, the giant Namazun happens to tug on Satoshi's line, and a wild chase begins. Satoshi has his Heigani use Crab Hammer on him to propel him over the Namazun, enabling him to fish it out of the water. Namazun drops the Badge Case, but the pokemon isn't finished yet! After a failed attempt by the Rocket-Dan to capture the giant pokemon, Suzumura lets out his Mokoko to fight the pokemon. 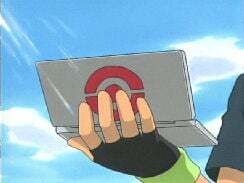 When that battle fails, the fishing master reveals his secret weapon--a Master Ball! Suzumura throws it, but the pokemon catches the Master Ball in its mouth and eats it! Regardless, Satoshi has his Badge Case back, so he's ready to continue on his way to Hiwamaki City. So I really like this episode. The fishing master is a great character (who is apparently a parody of Tsuri Baka no Nisshi), and seeing a Mokoko again after so long (when was the last thing it appeared? The third movie?) was a great treat as well. Plus, we get to see the debut of the Master Ball (that beach ball in "Beauty and the Beach" doesn't count), and Namazun, AND Hinbass. There's also some great comedy here, a look at one of the more neglected aspects of pokemon catching (fishing)...this episode has it all. So anyway, I'll bet 4Kids really hates Kids' WB! for forcing them to continue with this stupid Badge Case edit. Up until now, the case only really appeared for a brief shot at the beginning of a post-Gym Leader episode, but here the damn thing is all over the place. Despite the edits, though, the episode turned out really well. 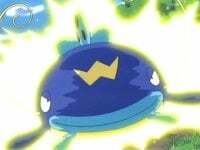 I like the voice 4Kids gave to the fishing master, and I enjoyed hearing the original music so much in this episode. About one second is cut from the opening shot of Takeshi's stew. 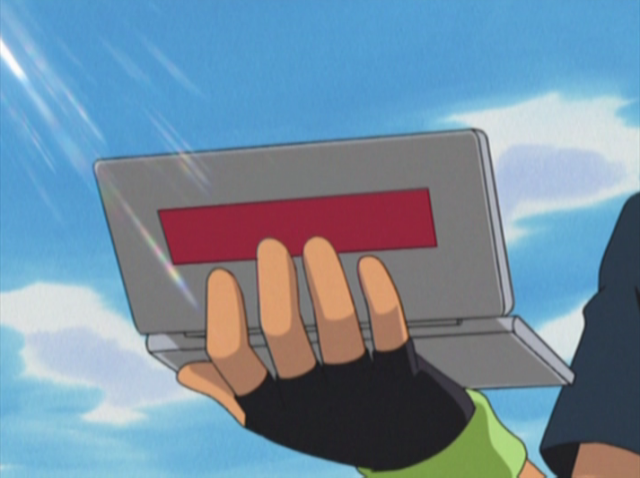 The major edit in this episode is Ash's Badge Case. All you people in Canada and the U.K. and Australia won't have to put up with it, but we Americans get to see frame after frame after frame of the little Monster Ball symbol changed into a red rectangle. So how weird is it that Sullivan is able to refer to himself as a "fishing god?" Hearing a word that's been taboo for so long suddenly brought up sure did surprise me, and I'm happy that 4Kids was able to get away with saying it. And finally, three seconds are cut from the TO BE CONTINUED... screen.